AMES, Iowa – Landus Cooperative recently donated $2,500 in conjunction with the Land O’ Lakes Foundation for a total of $5,000 to the Greene Fire Department to support the purchase of a new gator used for field fires and patient transplant in remote areas. Landus Cooperative is committed to supporting projects to enhance farm and agricultural safety and healthcare and emergency response services in our communities. 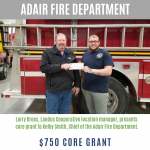 Landus Cooperative is pleased to partner with the Land O’ Lakes Foundation to provide an impact with this donation to the Greene Fire Department.